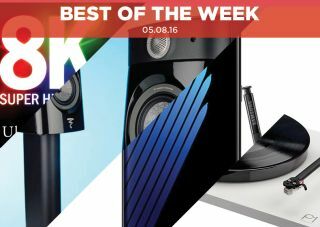 Best of the Week: BBC iPlayer loophole, Samsung Galaxy Note 7, new Rega turntable and more | What Hi-Fi? A round-up of stories to have featured in What Hi-Fi? this week, including our first impressions of Samsung's Galaxy Note 7, 8K broadcasts in Japan and a Rega Planar 1 review. This week Samsung unleashed its latest phone, the Galaxy Note 7, the BBC announced that it wil be closing the 'free' iPlayer loophole and Japan is already broadcasting content in 8K. On the reviews front we have the Rega Planar 1 turntable, the AKG K52 headphones and the Focal Sopra No.1 standmounters. It's also new What Hi-Fi? week with the September issue now on sale. In it you can get the lowdown on 32in HD-ready TVs, the best home cinema amplifiers for £500 and a roundup of headphones big and small, at a wide range of prices. MORE: September 2016 issue on sale now! At an event held earlier this week, Samsung revealed the Galaxy Note 7 and it comes with some novel features. The phone can be unlocked via an iris scanner, it's fully waterproof and comes with HDR (High Dynamic Range) video support. You can read our first impressions here. From September onwards you will have to pay the licence fee to watch content on BBC iPlayer. It's likely that household members will have to log in on their device of choice before they can watch live and catch up TV on the service. As the rest of world gets to grips with 4K, Japan is already ahead of the game with 8K. Public broadcaster NHK has begun transmitting content - which will include this year's Rio Olympics - in a format that's 16 times the resolution of HD. There's no consumer equipment as yet, so 8K content can only be seen at several public viewing areas located around Japan. "With the new Rega Planar 1, change is unquestionably positive"
Rega has been revamping its turntables, and the latest one is the Planar 1. Initially it's hard to tell what's changed, but practically everything has had a tweak from the weight of the platter to the balance of the tonearm. The changes only serve to improve on the Planar 1s already great foundation - it's a fantastic performer with no noticeable flaws. "The sound quality is well beyond what you’d expect for this price"
We've seen a fair few budget headphones, but this AKG pair could beat the lot. They're comfortable to wear and have an unexpectedly open-backed style of presentation. There's great clarity and detail as well as an evenly balanced sound. An absolute steal for the price. "They’re refined, forensic and pleasing in their ability to organise all that information effectively"
We've long appreciated Focal speakers for their classy looks and the Sopra No.1s certainly keep up that trait. They strike a refined balance and handle high frequencies particularly well. They lack a degree of punch and attack, but even so they are engaging performers.